1 photograph : b&w ; 18 x 22 in. 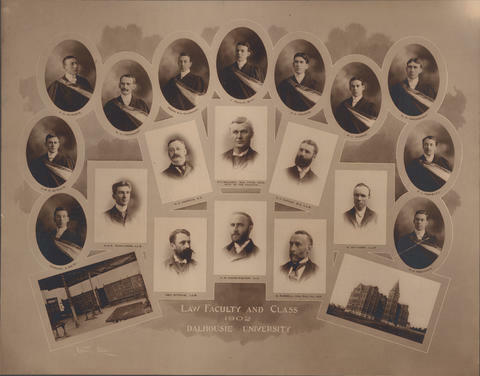 Item is a composite photograph of the 1902 Dalhousie University law faculty and class. The photograph consists of portraits of eight faculty and eleven class members. Students consist of: E.N. Rhodes; N.J.. Lockhart; Frank B.A. Chipman; J. Philip Bill; A.C. Calder; W.J. Harris; W.R. MacDonald; J.W.P. Ritchie; P.J. Worsley; Robert A. Reid; and R.A. Squires. Faculty members consist of: G.A.R. Rowlings; R.E. Harris; R.C. Weldon (Dean); C.H. Canan; H. McInnes; Geo. Ritchie; C.B. Harrington; and B. Russell. Photograoh is mounted on a matboard. Photograph has several tears, and one scratch.